The Bottom Line: Fans of serial killer fiction will find plenty of diabolical suspense in this engrossing thriller. Tailor-made for fans of Jo Nesbo and John Sandford. Somewhere in a corrugated metal shed, Washington University grad student Dina Levins wakes up from a chemically induced sleep. She recalls the horror of being taken from her car at a service station. She’s vaguely aware of the difficulty getting air through her broken nose. And when her abductor appears to taunt her, she notices how meticulously he has prepared for their “date,” as he calls it. In the shed, he has gathered a nightmare of torture instruments – a dentist’s chair, medical instruments and power tools. Dina attempts to escape, unaware that she is just one of many young women who has disappeared in recent months. Meanwhile, attorney Rich Moser is driving his usual Monday commute – 250 insanely dreary miles between his home in Chicago and his bank job in St. Louis – when he spots an angry fist banging from inside an RV. He recognizes the driver from the many miles he’s logged along this stretch of highway, a man he has come to think of as “Buck” based on a fictional profile he’s created in his mind. By the time Rich knows Buck’s real name, he’ll be involved in something far darker and more terrifying than he ever thought possible. 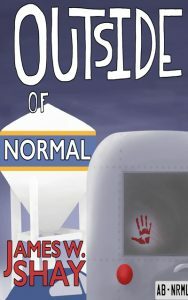 In many ways, James Shay’s novel is comfort food for fans of serial killer fiction: the signs of psychopathy in childhood, the desire to draw out and enjoy victims’ suffering, and the unholy teamwork of two like-minded killers. But what distinguishes Outside of Normal is Rich Moser, the everyman at its core. Reluctant protagonist Moser is far from the prototypical FBI special agent or homicide detective, skillfully engaging in the chess match between killer and investigator. Instead, Moser is just like any of us – a man dealing with an array of problems at both work and home, who needed to get drawn into this horrifying drama like he needed a hole in his head. But as deadened as his passion for life has become, his suspicions serve as a sort of spiritual resurrection. But as much as Moser himself may need salvation, intervention requires courage and conviction. As Moser crosses threshold after threshold, readers will ultimately find themselves asking, what would I do? One thing is for sure: by the time you’ve turned the last page, you’ll never look at an RV, a gas station or fishing cabin the same way again. Highly recommended.